According to an ancient Spanish proverb, there are three Thursdays that shine more than the sun: Holy Thursday, Ascension Thursday and Corpus Christi. The morning is bright. I climb the steep slopes of the city on foot, panting. My car has been left by the river. 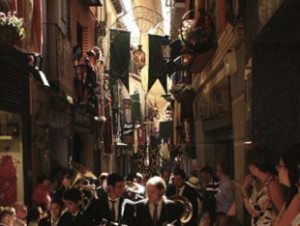 If driving around Toledo is usually a complex task, on Corpus Christi it is impossible, since the city’s narrow streets are closed. I am short of breath because the city is located on top of a steep hill, defended by the Tagus River and medieval walls. As I walk, I join many other Toledo residents and visitors who, like me, hasten to attend the grand procession. 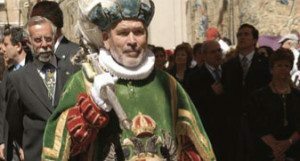 Although the winds of vulgarity that sweep today’s world have banished the good habit of dressing better on Sundays and holy days, today, everyone in Toledo wears their best. Every lady is dressed in some new garment and I watch them, enchanted, as they show one another their outfits for this special occasion. 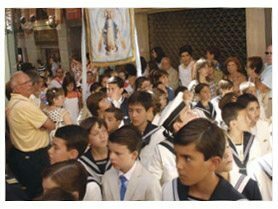 Spanish Boys wear sailor suits for their First Communion. As I approach Zocodover Square, the nerve center of the small town, I hear a volley of mortars high up, indicating that the Pontifical Mass is over and the procession is beginning to exit the cathedral through the Llana door. People are stationed throughout the entire route. 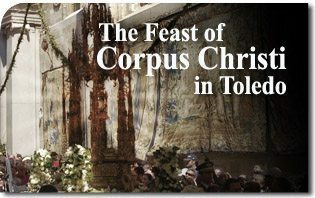 Only those participating in the actual procession — half of Toledo — and some guests have been able to attend the Mass inside the cathedral. Impatient but quiet, the “other half” of Toledo stands right up against the walls in order to clear the way for the procession. The road is dotted with wet sand and aromatic plants (lavender, rosemary and thyme), and the balconies are adorned with rich, embroidered veils and flags, colorful shawls, garlands, lanterns and cheerful flower baskets. As a sign of respect, and to protect the Blessed Sacrament, traditional white canvas awnings made by weaver’s guilds cover the streets and extend from one house to another. The whole of Toledo turns out to pay homage to the Holy Eucharist. Now I can see Civil Guards on horseback, leading the procession. Behind them march the City Hall drummers and the Civil Guard band. 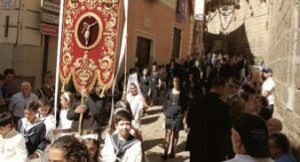 Then, the “beadle” follows dressed in black, carrying a staff the same height as the monstrance in order to make sure there is proper clearance. He insures no mishap will hinder the splendor of the procession. This grave gentleman is followed by a fifteenth century processional cross, a gift from King Alfonso V of Portugal. Displaying my press card, I walk quietly in the opposite direction of the procession. The whole itinerary is protected by cadets of the Infantry Academy, a legendary institution that defended the Alcazar fortress in the 1936 war against communism. 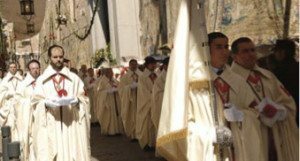 The procession forms two parallel lines, the priors in the center, chaplains and dignitaries of each guild preceded by their corresponding standard and carrying a staff, medal or element that distinguishes them from the other members. I pass by the Gardeners’ Guild. They are followed by boys and girls who have made their First Communion, groups of the Lay Apostolate and Perpetual Eucharistic Adoration, more than twenty brotherhoods with their respective banners, the Hospitality of Lourdes and third-order members of religious congregations. With the rhythm of its instruments, the City Council music band draws tears of emotion. I press forward, as I want to get to the door of the cathedral. There is little room. The wonderful symbiosis between the public and the procession, teeming with life, brings a sublime order of calm and poise to the city. I can now see the women religious of apostolic life, the Knights of the Order of Malta, the Chapter of the Mozarabic Knights and of the Holy Sepulcher, the Noblemen of Illescas, the Knights of Corpus Christi and others who proudly display their distinctive crosses on their capes. The seminarians, the regular and secular clergy, the Brotherhood of the Holy Charity and the famous Cross of Mendoza pass by with the acolytes and the Chapter leader. Luckily, I am already facing the cathedral, next to the military company, which forms the line of honor. From the outer walls hang 48 huge seventeenth century Flemish tapestries with Eucharistic allegories, woven especially for this celebration. The famous Toledo monstrance, commissioned to Enrique de Arfe, a great 16th century silversmith, by Cardinal Cisneros is about to cross the threshold of the Llana door. I feel people around me holding their breath. The thrilling silence that precedes the monstrance’s appearance gives way to an apotheosis of applause, only drowned out by the roar of the 21 firing guns (honoring the Body of Christ) and the solemn ringing of bells. The military formation salutes the Blessed Sacrament as the band furiously plays the Royal March. Through the cloud of incense that envelops us, the Blessed Sacrament slowly advances. God is with us! The rich Gothic monstrance, made with over 400 pounds of silver and almost 40 pounds of gold, is mounted on a carriage with flowers and escorted by the cadets of the Infantry Academy. Following it is the second part of the procession, which includes the highest dignitaries: the Archbishop Primate and his entourage, the regional and provincial authorities, the City Mayor with his staff and the university faculty. Closing the procession is the Honor Guard of the Infantry Academy, with its flag and music band. Each parish church carries their banner. To worship Christ the Redeemer! Bless the Lord, heaven and earth. Forever love of Thee, O God of love! Indeed, the sun shines in Toledo, but He who makes the sun shine is elevated in the monstrance, and that’s why the Blessed Sacrament dazzles far more as He passes through the streets of Toledo! This entry was posted in Catholic Perspective by Felipe Barandiaran. Bookmark the permalink.